Playing this on a baritone ukulele is really fun and sounds pretty cool just to put that out there! Hey, just a suggestion to anyone who can’t play the ukulele too well or are beginners, playing it in C is easier and still sounds beautiful ? I’ve tried a couple different transposes, and I have to say my favorite is definitely -2, just saying you guys; sounds just like the song to me. Anyways, have fun! Gorillaz are a british virtual band (currently on hiatus) formed in 1998 by a collaboration between Damon Albarn of Blur and Jamie Hewlett, co-creator of the comic book Tank Girl. They had the idea to create the band while watching MTV in their London flat and originally intended to call the project Gorilla. 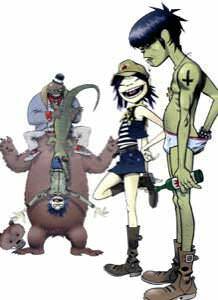 The band is comprised of four fictional band members: 2-D (vocals, keyboard), Murdoc Niccals (bass), Noodle (guitar, vocals), and Russel Hobbs (drums). These characters only appear in animated form and are not alter-egos of real people, as is often mistakenly assumed. .